The Somerset floral bridal headpiece is all about understated opulence. It’s a striking combination of classic femininity and elegant, show-stopping glamour. Quintessentially feminine, nostalgic and exquisite. Designed to be worn at the back of the head to frame both updos and loose hairstyles, we think the Somerset is the perfect piece for a stylish and modern bride wanting to make an impression as she walks down the aisle. You might not see the piece when you look in the mirror but your guests certainly will! *LIMITED QUANTITIES – Due to the popularity of the Somerset headpiece, we have limited materials available to create this design. If you love this comb, we recommend you secure it before we are no longer able to recreate it. Featuring handcrafted clay flowers, brass findings, freshwater pearls, Swarovski crystals and pearls, Czech seed beads. The Somerset headpiece is ready to ship. Please allow 5-7 business days for processing plus delivery times. The Somerset bridal headpiece was designed for high necklines, low backs, illusion necklines, sweetheart and strapless bodices, and cropped two-piece ensembles. It’s the perfect piece for low, mid set and high updos, as well as half up/half down hairstyles. Its sturdy yet flexible design means it can also be styled into higher and fuller updos by curving the piece to the contours of your hairstyle. For low set styles, manipulate the shape of the Somerset into a soft U or V shape and insert the combs into place. For half up styles, it can be worn straight with a gentle natural curve. Somerset’s versatile design means you can achieve multiple looks on your wedding day. 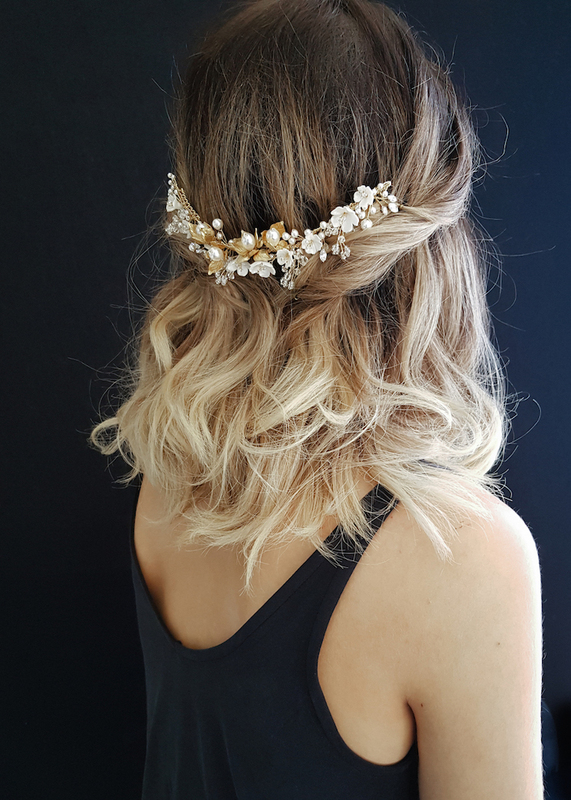 Many Somerset brides have styled this piece in a romantic updo for the ceremony and then repositioned the headpiece into a relaxed down hairstyle for the evening festivities. We love the look of the Somerset with a wedding veil, both with or without a blusher. The distance between the combs on the headpiece allow for a veil’s comb to slot in between seamlessly creating a clean and sophisticated bridal look. Browse our full veil collection or contact us and we’d be happy to offer a recommendation to suit the Somerset based on your wedding dress and hairstyle. Details can be reworked into a new style – for example, a hair pin set or a crown with a lower or higher profile.